We love homemade cinnamon rolls, but they take a lot time to make. We were in the mood for cinnamon rolls last weekend, but I didn't to spend all morning in the kitchen. I came up with this super quick alternative. I used a can of refrigerated Grands biscuits and stuffed them with cinnamon chips. I find the cinnamon chips at Wal-Mart this time of year. If you can't find cinnamon chips, try butterscotch, chocolate or even peanut butter chips. The biscuits were ready in no time and tasted fantastic!! I think these would be perfect for an easy Christmas morning breakfast. Separate each biscuit into two layers. Lay half the biscuits in the prepared pan. Sprinkle 1 tablespoon of cinnamon chips over each biscuit half. Cover with a second biscuit layer and lightly press the edges to seal. Sprinkle remaining cinnamon chips on top of sealed biscuits. Bake for 18-20 minutes, until golden brown. While biscuits are baking, prepare glaze. Mix powdered sugar, vanilla extract and 1/4 cup milk. Stir and add more milk until desired consistency is reached. 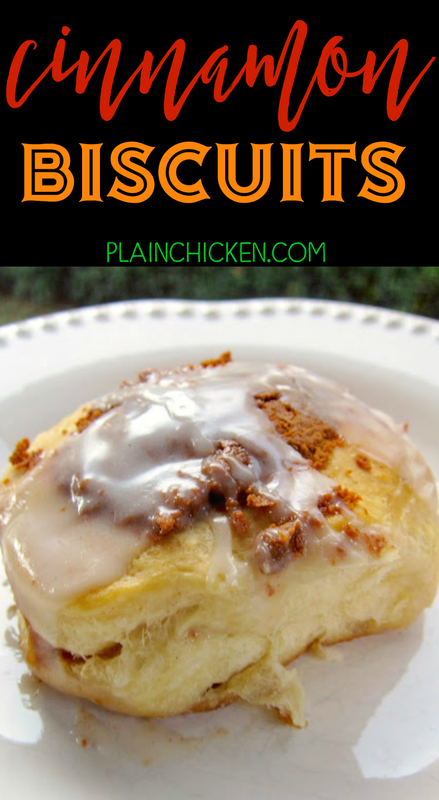 Pour glaze over hot cinnamon biscuits. This is for mini cinnamon rolls using crescent rolls. I have been wanting to try. which walmart? I look for cinnamon chips every time I go and cant find them. Susie - I found them at Publix today and the Wal-Mart on 280 earlier. I have been making these for over 20 years using refrigerated biscuits. I take melted butter/margarine and dip the top of each biscuit in it, then I dip the biscuits in a cinnamon-sugar mixture. (Dipping puts a more even cinnamon-sugar coating on the biscuits; however, sprinkling the mixture will work just fine.) Place them in the pan, touching, and bake according to package directions. I make a simple glaze with powdered sugar, a couple teaspoons of milk, and vanilla; add some softened cream cheese for something different. My family and I think the smaller canned biscuits that come 4 cans to a pack make a better-tasting cinnamon biscuit. I also use these same ingredients to make monkey bread. Cut the biscuits into 4ths, drizzle with melted butter/margarine, toss with cinnamon-sugar mixture, and place in a greased loaf or bundt pan and bake.